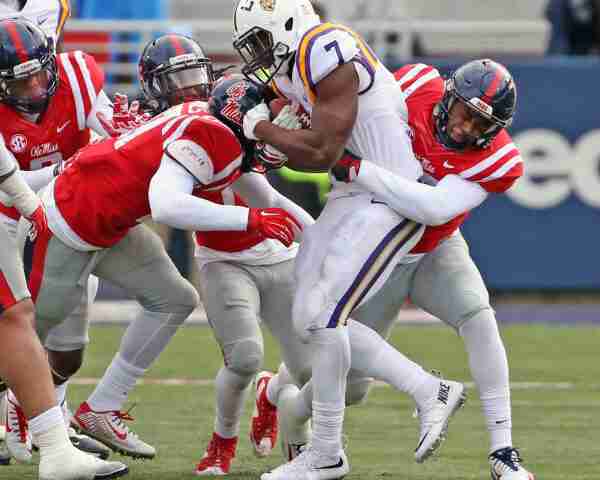 In its quest to shut down LSU’s star running back Leonard Fournette, Ole Miss (8-3, 5-2 Southeastern Conference) looked to a mixture of veterans and new faces, all of whom were hyped for prime-time action Saturday afternoon. The Landshark defense stuffed Fournette time and time again, limiting him to a total of 108 yards on 25 carries, an average of 4.3 yards per carry. 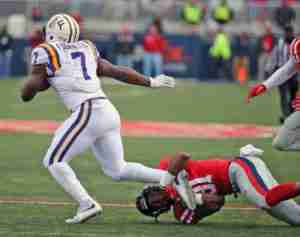 Perhaps the Rebels’ coaching staff took a look at how both Alabama and Arkansas were able to limit Fournette to under 100 yards in their games against the Tigers this season. When facing Fournette, both Alabama and Arkansas sent a line of troops towards the 6-foot-1, 230-pound running back, and his offensive line could do little to stop the attack. In Saturday afternoon’s SEC battle in Oxford, Ole Miss did much the same thing, and it worked to perfection as the entire Tigers’ offense folded right in front of head coach Les Miles and the 60,705 fans inside Vaught-Hemingway. And the Landshark defense loved every minute of the Rebels’ 38-17 Magnolia Bowl victory. Couldn’t be more proud of the way the defense fought when their backs were against the wall, particularly in the red zone. Even on the fumbled kickoff, we fought to not let them in. I can’t complain about the passion they played with. We still have some things that we need to improve on. We were without a lot of kids tonight. We got better from two weeks ago in a lot of areas. With both senior linebacker Denzel Nkemdiche and junior defensive end Fadol Brown out for the game, the Rebels turned to some new faces, most notably sophomore linebacker DeMarquis Gates. In a high-profile SEC game, Gates did not disappoint. He finished with a team-high 14 total tackles, a pass break-up and a quarterback hurry. Gates was all smiles entering the team room after the win. He wasn’t too concerned about finishing with the best stat sheet or making a highlight-reel play; he was more focused on being a team player. And if his name is called for next week’s Egg Bowl showdown with Mississippi State in Starkville, Gates will be ready to hit the field once again. Senior LB Christian Russell collected his first career interception. Freshman DB Zedrick Woods grabbed his first career interception. 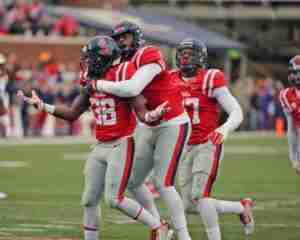 Senior DB Mike Hilton had nine tackles and a TFL. 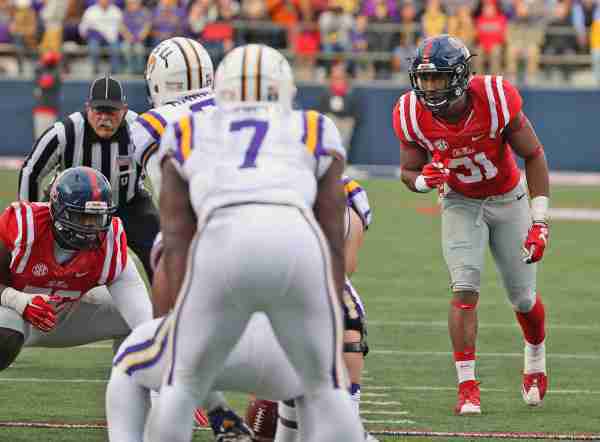 He entered the game leading all SEC defensive backs in tackles for loss this season.